OMA's design for the Seattle Public Library--one of the firm's most heavily anticipated projects to date--begins with a radical rethinking of the very nature of the library. If the library exists today as a threatened sanctuary, it has been done in by its own stubborn reliance on one kind of literacy and its consequent blindness to other emerging forms that increasingly dominate our culture, especially the huge efficiencies and pleasures of visual intelligence. Rather than merely package this traditional institution in a new way, OMA has completely reinvented it, transforming it wholeheartedly into a site able to aggressively orchestrate the coexistence of all available technologies for collecting, condensing, distributing, reading, and manipulating information. The library will no longer be loyal to the book... In more architectural terms, the $156 million building has an angular, mesh-like glass and metal skin that surrounds a series of floating public spaces: a kid's area at the bottom; a living room for browsing, public meeting areas, and a coffee shop; a mixing chamber where patrons can work intensively with librarians; and a reading room at the top with views of Mount Rainier and Puget Sound. In between these platforms are a series of programmatic boxes containing the more stable, or fixed, parts of the library program, including a continuous four-story book spiral where the entirety of the library's books will be stored. This third book in Actar's series of "Verb monographs reveals how the Seattle Public Library works, and examines it in terms of new media technologies that have changed the status of the library in the contemporary city from a traditional repository for books toan "information store." Also included is a comprehensive account of the design process, from initial concept through construction to ribbon cutting. The Office for Metropolitan Architecture (OMA) is a Rotterdam-based firm practicing contemporary architecture, urbanism, and cultural analysis. Founded in 1975 and now led by four partner--Rem Koolhaas, Ole Scheeren, Ellen van Loon, and Joshua Ramus--the office gained renown through a series of groundbreaking entries into major competitions. 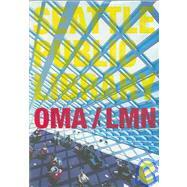 In 1994, OMA completed Euralille, a 70-hectare business and civic center in northern France hosting the hub of the TGV. More recently OMA has concentrated on urbanism and infrastructure projects in Asia, including the New Seoul International Airport City. Current projects include the construction of the New City Centre for Almere, Netherlands; the Prada epicenter store in Los Angeles; and its largest project ever, a new station for China Central Television in Beijing.